Home > Used Vehicles > 2015 Nissan Pathfinder S,4X4,AIR,TILT,CRUISE,PW,PL,ALUMINUM WHEELS,KEYLESS ENTRY,BACK UP CAMERA,LOCAL TRADE!!!! 2015 Nissan Pathfinder S,4X4,AIR,TILT,CRUISE,PW,PL,ALUMINUM WHEELS,KEYLESS ENTRY,BACK UP CAMERA,LOCAL TRADE!!!! Hot Deal! We've marked this unit down $2978 from its regular price of $26900. 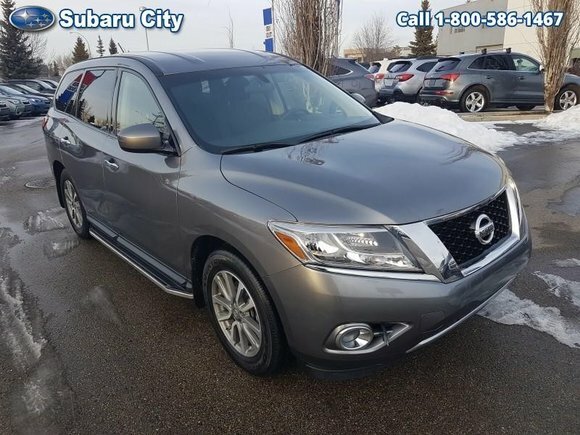 This 2015 Nissan Pathfinder is for sale today in Edmonton. Load up the entire family with space to spare in this Nissan Pathfinder. This versatile crossover is just as at home eating up miles on the highway as it is running errands around town. With a comfortable interior and respectable fuel economy, the destinations are endless. A sculpted exterior makes this Nissan Pathfinder is one of the most stylish three-row crossovers on the road. Capability at this level always makes for memorable adventures. This SUV has 55346 kms. It's gun metallic in colour. It has a cvt transmission and is powered by a 3.5L V6 24V MPFI DOHC engine. Buy this vehicle now for the lowest bi-weekly payment of $157.23 with $2595 down for 84 months @ 5.99% APR O.A.C. ( taxes included, $790 Administration and Secure Ride included / Total cost of borrowing $5264 ). See dealer for details. Want to try the 2015 Nissan Pathfinder S?